The second edition of Red Hook Crit in London will forever be known as ‘The One That Dani King Entered’ so it’s hard to remember that hidden somewhere within all that are the unique, deeply personal stories of the other sixty or so female riders who made up the rest of the field. Without them, there would be no race. Last year, inspired by watching one of the first women’s Red Hook Crits in Milan back in October 2014, I randomly took the plunge and entered my first RHC; in fact my ever fixed gear crit. I remember sitting on Torquay beach processing my application on Eventbrite then quickly posting evidence of my intentions on social media so I’d be forced to go through with it. It was just a month before the race so I had little time to prepare but I found the process of training and the focus it demanded extremely therapeutic, albeit tough! The race itself was one of the hardest but most amazingly exhilarating things I’d ever done, so after London, I signed up for the next race in the series, in Barcelona. Over the next winter I paid attention to my training and began preparing early for the 2016 Red Hook Crit season. I put in many hours on the turbo trainer, bulked up my little leg muscles at the gym and entered as many local races as I could. I thought about Red Hook Crit A LOT. It was what inspired me to race and kept me training hard when I felt like bunking off. In the end, I injured myself racing mountain bikes and couldn’t ride. I also had to go back and forth from hospital for some (unrelated) treatment I was receiving. Then I totally buggered my back, so my training was cut short and I spent loads of time off the bike. When off the bike, I just kept thinking about how this period of inactivity would affect my chances at RHC. The point I’m getting to, is Red Hook Crit really matters to me. I absolutely love it. I love the way it’s made me stronger, more competitive, more focused and given me more drive. I love the new friends I’ve made, the party atmosphere at the race, the sheer exhilaration of huge crowds applauding my friends and I when we ride. It’s killer! So, London. Here’s how it went down. When I’d found out the week before that Dani King was entering the women’s race, I’d just laughed. 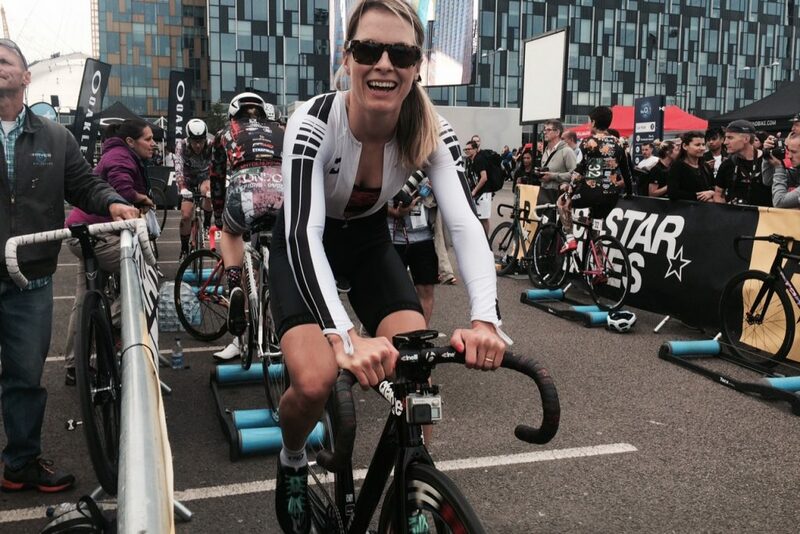 In case you don’t know who she is, Dani King MBE is an Olympic Gold medallist and World Champion on the track. As she’d been expecting to race in Rio but for some reason wasn’t chosen, she was bound to be exceptionally quick, but I wasn’t too bothered – to be totally honest, there are other women in the race who are faster than I am so I figured the race for the podium would be fought out between those guys. I was just looking to improve on how I did last year and maybe (hopefully) make the top ten. 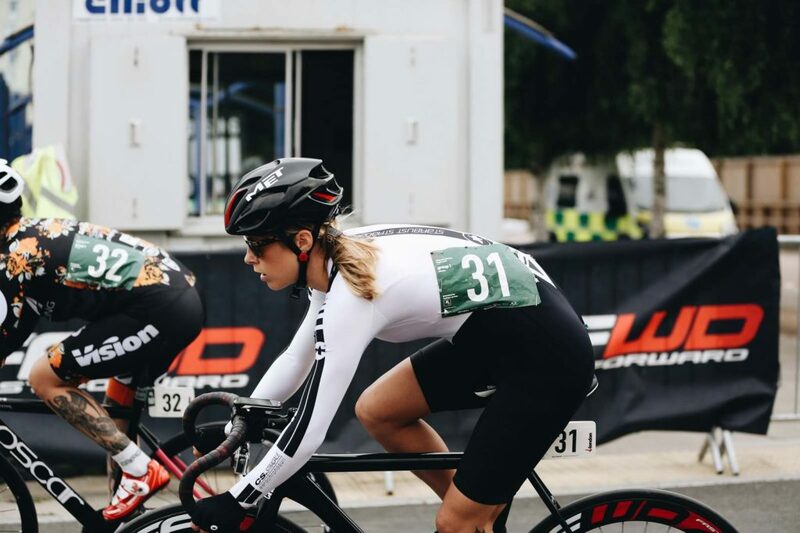 The Red Hook Crit is the fastest, toughest fixed gear crit in the world and attracts enormously strong athletes, so doing that is still a really tall order. Unlike the men’s race where 250 riders compete for entry to the main race by setting their fastest qualifying laps, all female riders go through to the evening’s ‘feature race.’ We still ride a qualifying heat but it’s done to determine your starting positing on the grid. The higher you qualify, the closer to the start you get to line up. There are fewer teams in the women’s race and so fewer riders are able to work together to set a fast lap time, either by leading each other out or by working as a ‘chain-gang,’ so a lot of solo riders (such as myself) try and watch what the few teams (Why Be Normal, La Classica Speedgang) or fast women are up to during qualification. It’s almost impossible to set a fast lap entirely on your own, particularly last Saturday as it was really windy. In the end, I saw a few fast girls sprint off to take their ‘hot lap’ and pursued them, hoping I could use them as a windbreak and set a fast time too. I was sat about 4 women back and the woman in front of me turned out not to be as fast as the two in the lead who rode off and left her behind. In the end, I managed to get round her on the long straight and just ride the rest of the lap solo. From 62 women on the start list I qualified 15th. Lining up at the start, I had no idea what was going to happen in the race. I’m a good sprinter but having had so much time off this year I was wondering how I’d fare fitness-wise in this crazily intense race. Last year I was fully ‘in the red’ for the whole race; from about two laps in, every single turn of the pedals was incredibly hard, I could barely breathe and felt like I couldn’t go on, even though I did of course, go on! I wasn’t really concerned about Dani King. I was more focused on myself to be honest. We sprinted off from the start. My aim was to stay in the front group, whatever it took. The first lap was quite slow; everyone was sussing each other out and eye-balling Dani King to see what she was going to do. 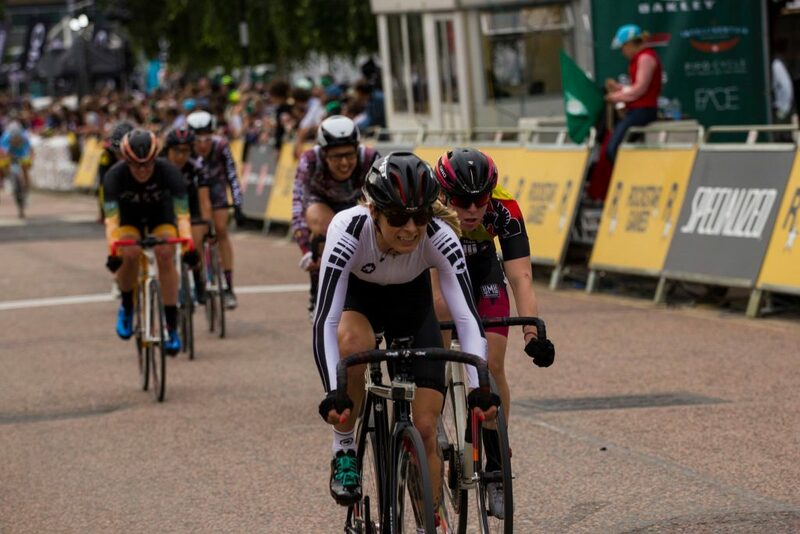 Things sped up on the second and third lap, and then at some point, Dani King tried to sprint off, everyone tried to reel her in and the bunch got strung out. I tried to stay with the front group but a gap opened up and I was stuck on my own for a lap until I eventually caught Ashley Faye. It turns out I dragged quite a few people over when I closed that gap to Ashley. Meanwhile, those in front had broken away. Ashley, Corine Price and I took a few turns each on the front then Marion Dwiznik joined us, at which point, it became just Marion and I taking turns for several laps. Having managed to catch up with us, Marion was desperate to bridge over to the front group but with just me and her working it was really hard to do that. Eventually, Johanna Janke took one turn. No one else did and I started getting quite annoyed. I gave up any hope of bridging over. The motorbike came up behind us and seemed to be telling us to pull over. We saw a blue flag. We’d been lapped by Dani King. Unbeknownst to us, whilst I was working hard to catch up with those in front of me, Dani King had pulled away from everyone and soloed her way around the circuit hoovering up slower riders. Those at the back of the field only got to ride a measly 4 laps before they were caught and pulled out. We were the penultimate group to be pulled out (having ridden 13 laps) and shortly after we figured out what the hell was happening, we were joined by the rest of the women’s field, bar Ash Duban and Jasmine Dotti who had still not been caught by Dani King. At first, I just shrugged it off. We’d been outdone by someone far faster than us, so what was there to worry about? It then became apparent that we’d been assigned our finishing positions based roughly on where we were when we were pulled out, which was a bit rubbish, because knowing who was near me and looking at my 14th place and some of the data (speed, fastest laps) published afterwards, um, possibly I might have come a couple of spots higher. Or maybe I wouldn’t have? Who knows? It would have been nice to have had the chance to sprint to the line with my fellow competitors rather than having the race finish in such a way, but hey, the organisers had to do what they considered safest. The protocol was that lapped riders would be pulled out, so it’s not like they could suddenly change their mind in the middle of the race. In the end, the crowd got to watch three riders going round and round in circles for the second half of the race, so whilst I think Dani King is amazing, that much have been less interesting than watching 60 fast women battle it out with all the high octane drama and tactics that crit racing involves! So what now? Well the next Red Hook Crit takes place in Barcelona and I wouldn’t miss it for the world. I’ve always relished the chance to pit myself against some seriously fast ladies – that’s part of Red Hook; it’s meant to be tough. It means too much to me to give up because someone outdid me, although yes, it’s disappointing to only ride half a race. What will happen there is anybody’s guess. Will Dani King race, will they allow the chasing group to stay in if they’re lapped (like they frequently do in road crits) and most importantly, will as many women enter as last time? I don’t think a fast competitor should be a deterrent to racing but if you train hard all year and spend all your money travelling to the Red Hook Series then get half a race and awarded an estimated finishing position, I understand it might make some people think twice. Not me though. See you in Spain! Watch my race day video below with onboard race footage.